Homemade Vanilla Extract and All Extract Flavors are Simple! Every year at the beginning of December I get out the family recipes and spend an evening pouring over them. I make a plan for which ones will get made for the family and what I would like to make for gifts. With each year that I have gone further into the culture of traditional food, this process has become more and more challenging. So many of the cookies and candies that my grandmothers made relied heavily on artificial colors and flavorings. They often included refined sugars and flours, margarine or shortening. I have struggled with how to reproduce the treats from my childhood while maintaining the lifestyle we have established in our home. The sugars and flours are relatively simple to update. We use sprouted flour and replace the refined sugar with maple syrup, evaporated cane juice or sucanat. The shortening and margarine gets replaced with lard and butter. Honestly, the replacements make much tastier treats! The dyes and flavors take a bit more time and effort. There are many herbs that can lend color to foods, but it takes practice to get the hang of using them. Some of the plants add a flavor that you might not want in a cookie. Green is especially difficult. Red is relatively easy if you have beets around. Beets are sweet anyway, so they add a sweet moistness with their natural dye that is delicious in cakes and cookies. Flavorings were frustrating until I realized that they are really just tinctures used for taste rather than medicine. I have found that homemade flavorings are tastier than the chemical options and they make great gifts! Some of them do require a bit more time than others to make so plan ahead for next year. One of the first, and most popular, articles published on DIY Natural was a simple homemade vanilla extract recipe. We still use it and love it, enjoy! Great for baking or sweetening up holiday cocktails. 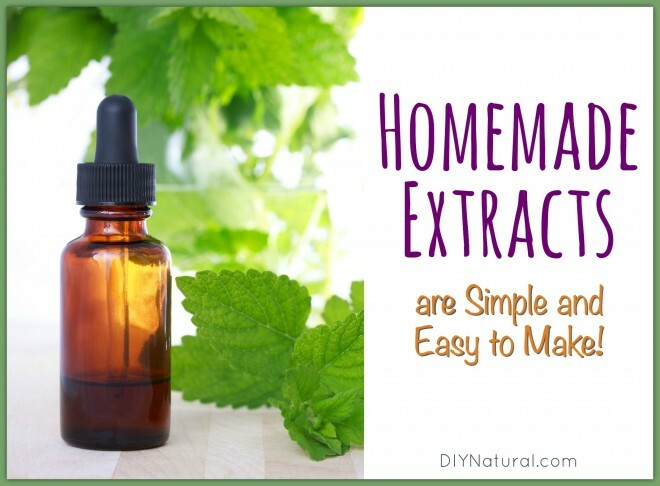 While expensive to buy, this extract is easy to make! Choose a glass container with a lid. You should have enough stevia leaf to fill the jar about half full. If you are using fresh stevia, be sure to allow it to wilt for several hours in a warm room. Cut or crush your herb and be sure to cover it completely with alcohol. Shake several times a day and allow to steep for 2-3 days. Strain and store your extract in an amber dropper bottle. Start with just 2-3 drops in any given recipe. This extract is very sweet! This can be done with just about any kind of flavor you like, including citrus peels, cinnamon, anise, vanilla and more! Choose a glass container with a lid. You should have enough peppermint to fill the jar about half full. If you are using fresh herbs, be sure to allow it to wilt for several hours. Shake at least one a day and allow to steep for 4-6 weeks. Strain and store your extract in an amber dropper bottle. You can use this extract just as you would store-bought in baking. With candy you may need to use more extract than the recipe requires. Have you ever made flavored extracts? Which ones? Thank you all so much. This is new to me but I am sure learning. I will try them all. Happy New Year and all the best wishes. Blessings. Extracts are hard to use in candy like hard tack because of the high heat. Oils withstand the heat. So instead of an infused extract, perhaps an infused oil….like peppermint in olive oil instead of alcohol? I really enjoyed this article. I plan to grow some herbs this next year and am prompted now to grow my own stevia. I use it alot and can’t help but believe I can save money making my own extracts. I’m going to do some experimenting with making flavored stevia extract to use in all the ice water I drink every day. I’ve tried buying these through companies that make them and they are just nasty. I didn’t pay attention to how simple it could be to make any extract until now. I have wiled black raspberries that come up among my other berries. These have wonderful flavor but they are more seed than flesh so I have found using them as an extract is the best use. Berries can be extracted the same as above directions except that the daily shaking dose not need to start right away unless there are some berries floating. Before extract is to be removed from the seeds several days of shaking and settling will allow the extract to be poured off leaving the seeds behind. Recommended uses is to ad fragrant flavor to drinks and deserts . For the commenter that was concerned about the alcohol content; when used in cooking the alcohol is evaporated and if added to hot drinks and allowed to set for time will also evaporate. I have Native american ancestry, biochemistry. so alcohol is toxic for me, what is a none alcoholic way to do this? and or to make medicinal tinctures? I want to make a lemongrass tincture, alcohol free? could I use a carrier oil instead, such as sunflower oil? You might try tincturing in glycerine. For the flavor compounds mentioned in this article it should be sufficient. I have been looking for a rootbeer extract that tastes good. Do you have any ideas? Hmm…. you might try a real rootbeer recipe. Perhaps sarsaparilla and birch might make a flavoring you like. The only part of a rootbeer recipe that would not be safe to tincture would be the sassafras… it’s safe as a tea, but will isolate inappropriate compounds in alcohol. Good luck!